I am on a constant lookout for new ways to stay organized. Owning a piece of property will bring out Danny Tanner-esque habits that one never knew existed. In previous residences, I never put much time into storage and de-clutter because the lease expiration date was always looming in the distance. I was always thinking of moving. Knowing that I will be staying where I am now for several years, I have no qualms about improving the space. Really, organizing is just a way of making a space easier to keep clean. Who doesn’t love that?! Better Homes & Gardens really gets me. They know what I’m about. That’s why they’re always sending me emails with new storage ideas. Of course, some of the slide-shows they send me are a complete waste of time, especially when they fore-go instructions for a measly “Find a decorator in your area” link. But every relationship hits rough spots. They always make it up to me with flowers (I’m talking beautiful centerpieces in my email). I can’t possibly use all the ideas given, especially with my 20 sq. ft. pantry/laundry room/coat room, but I can sure as heck pass the good ones along. Think of me as a weed whacker. 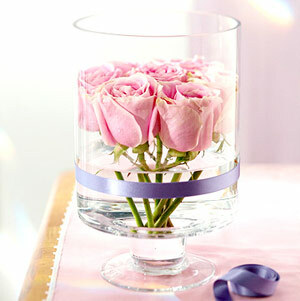 I cut through the unsightly disaster to bring you beautiful, inspirational ideas for your home. 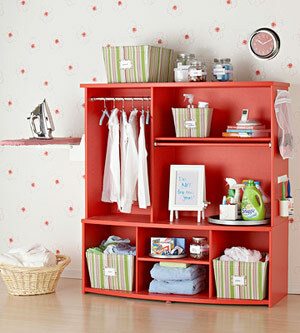 This small red laundry caddy was once an entertainment center, before the days of wall-mounts. A can of paint, a few screws, and a metal pole later: stress free laundromat. Lazy Susans are not just for picnic tables anymore. I have 1 in my fridge for various sauces and condiments. Everything is within easy reach, refusing to be forgotten about to the point where it no longer resembles its original state. Seriously, these things have saved me so much money. I can’t tell you how often I used to make my grocery list, jotting down an item I already have because it has been relegated to the back of the fridge. AND..they’re under $10! Make sure to get one with a raised lip to avoid sliding. 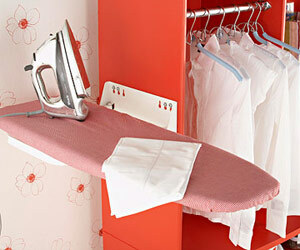 I LOVE this floating ironing board. I, myself, use a steamer for all my wrinkly garments, but if I had an ironing board, I would definitely mount it to something. If you’re new here, I love things that float. Floor space is very valuable in a condo. Most of us have those few articles of delicate clothing that won’t hold up in the rough and tumble of the dryer. We’ve all seen the fold-up drying rack that gets propped in the middle of your bedroom/ living room/ kitchen, etc overnight until your clothes are dry. Or worse, if you’re like me without such rack, you resort to draping your clothes over pieces of furniture. You should see our place after laundry day, it’s as if our bedroom closet spit up. But this little treasure is out of the way even when in use. I don’t hang my wet clothes like shown here, for fear of them losing shape, but all the wooden bars are perfect for draping articles over. These are somewhat pricier than their cumbersome counterpart, but given how much I hate waking up to wet clothes in the living room, I’ll spend the extra $30 on the floating variety at Amazon. 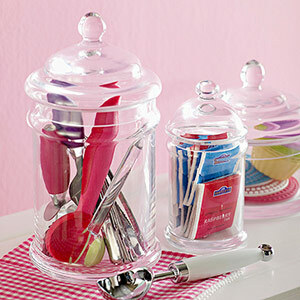 I am a fan of glass containers. I have several on my vanity for hair ties, make up brushes, earring studs, etc. I have 1 in my laundry room as a “lost & found” for quarters and such that fall out of our pant pockets during the wash cycle. I also have several under my bathroom sink for shaving necessities, chapsticks and the like. They are very affordable…as low as $2 at Walmart, and can come in all shapes and sizes to meet your needs. Always remember that practicality can be pretty. 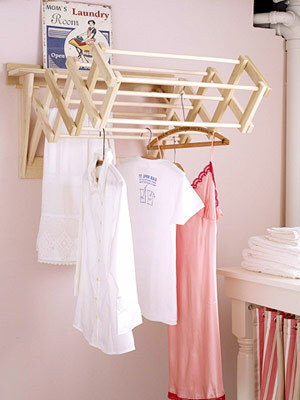 Guests may not see your laundry room, but that does not mean you should neglect it. 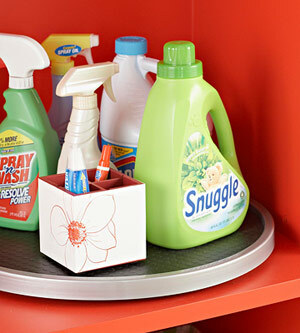 With simple solutions like these, you’ll be looking forward to laundry day before you know it! Wash on! It has been a busy busy week. We have our long awaited housewarming party tomorrow (we’ve been living here 6 months now) and I had much to get done before showing our new place off to a bevy of friends. Loads of DIY and even more loads of photos. I will also post some beautiful “after” shots of my dining room, living room TV wall (very rare in previous posts), bedroom vanity with improved storage and organization, and our office closet that was once used as what-we-have-yet-to-unpack-because-we-have-nowhere-for-it-to-go storage. 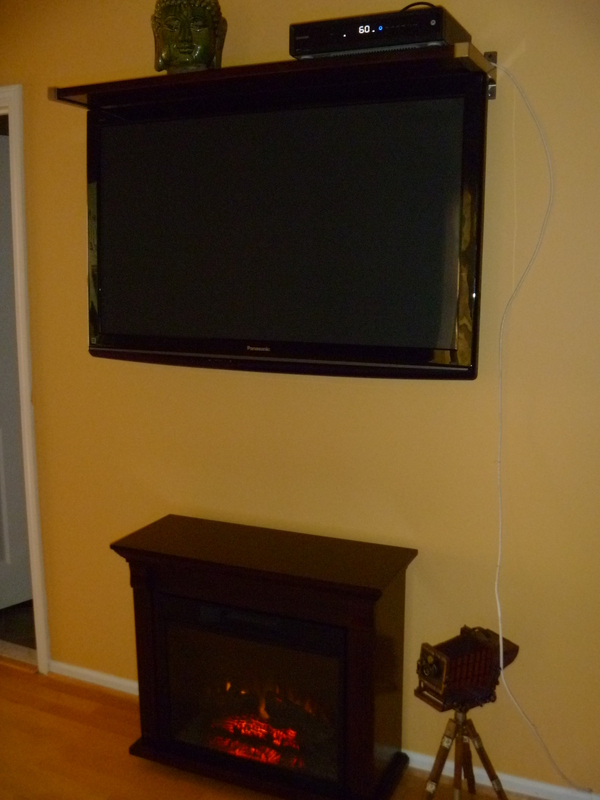 Our TV wall with our fancy new fireplace was greatly devalued by this unsightly cable wire. I knew what had to be done, but between all my trips to Home Goods and Boscov’s, Home Depot just wasn’t a priority. With the party quickly approaching, I could put it off no more. The materials: This 9-piece cable concealer kit came in a pack for $10. 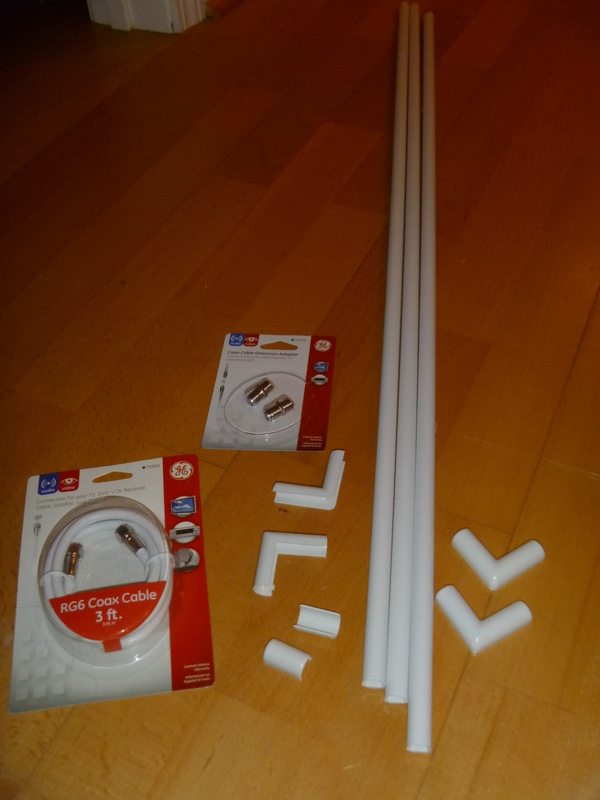 The 3 ft. cable extension and connectors were an additional $6. The tunnels have a tight opening that the wire must be squeezed through. 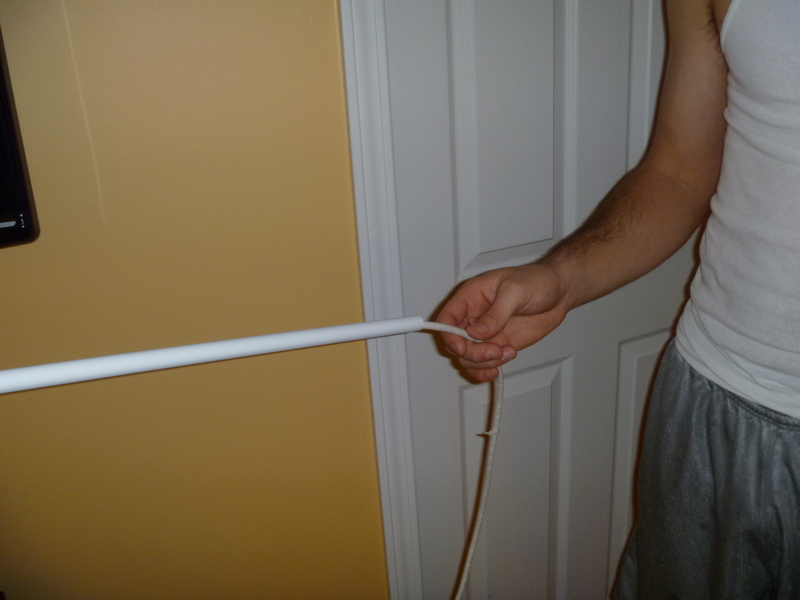 It can be a little difficult initially but with the help of some pliers and maybe a second person, it’s easy enough. 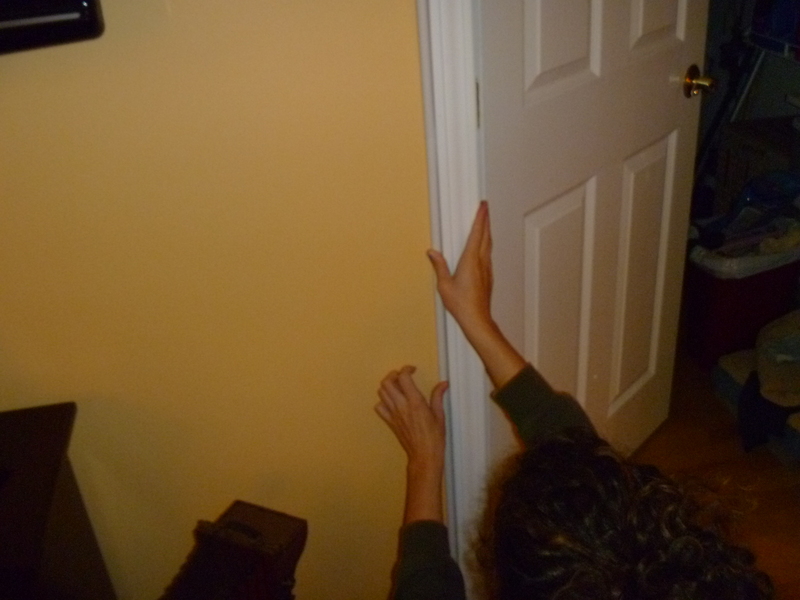 There is a self adhesive strip on the back (which is flat) for easy application to any wall or molding. Just peel and press. The corners are a little tricky. They don’t have a back because the wire would be very difficult to feed through, and if you were able to feed it through (which I have never tried) I can imagine it would be tough to adjust if need be. Instead, it just snaps on, which maybe look messy at first, but once both straight ends are on, it will look professionally done. Paint it accordingly and Voila! 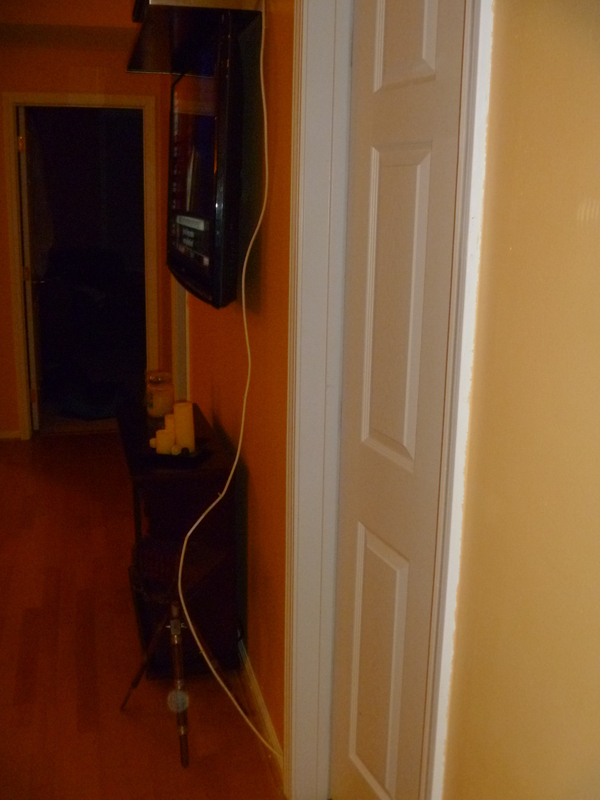 a wall mounted TV sans wires. 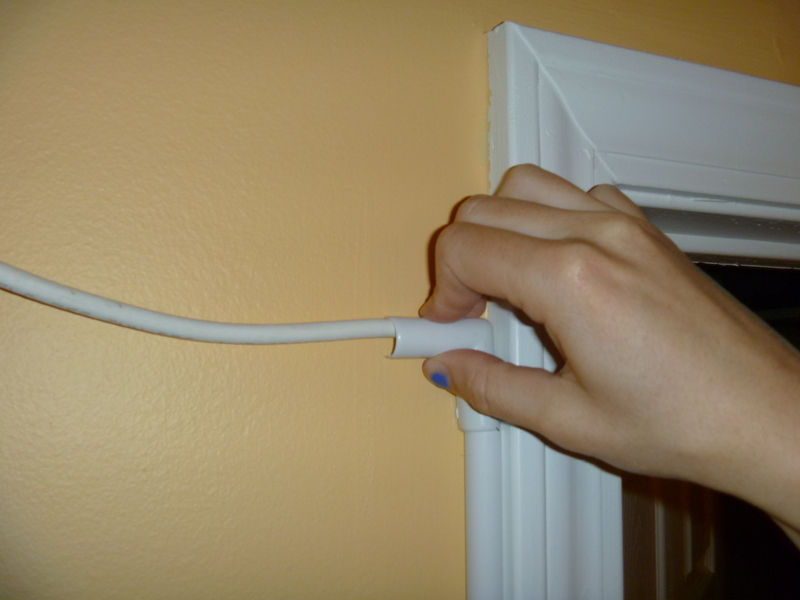 I only painted the section that crossed the wall, mostly to avoid using painter’s tape, but the molding conceals the concealer enough for my taste. 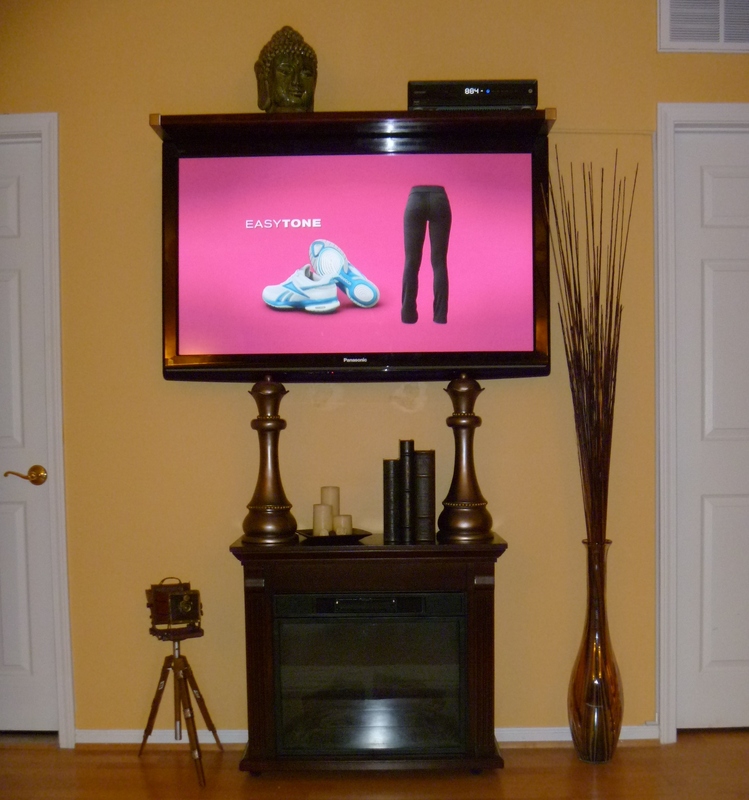 I may have mentioned before our dilemma with where to place the TV upon move-in. Our breakfast buffet is the only divider between the kitchen and living room. Therefore, we really only have 3 walls in our living room, and 1 of those 3 walls (above) is part of the “hallway” from the front door. But in a small condo, utilizing every inch is necessary. If we used this wall as the said “hallway,” we would cut approximately 64 sq. 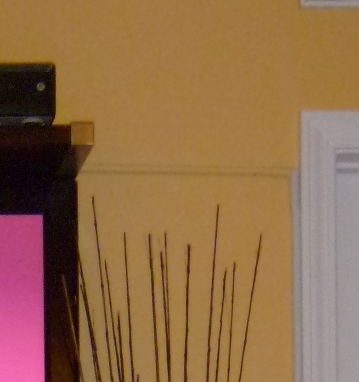 ft. off of our living room and the TV would have to be watched from an uncomfortable angle. Seeing how it came out makes me wonder how we ever doubted this option.